Bootstrap Business: Are You Making These Top 5 Marketing Mistakes? Are You Making These Top 5 Marketing Mistakes? Author Bio: Guest blog post contributor Alexandra Bohigian is the Marketing and Sales Director at Enola Labs Software, a software development company and AWS consulting firm. Marketers can go on and on telling you all of the things you need to be adding to your marketing strategy in order to boost your business. Sometimes, the better advice lies in the things that you should not be doing in marketing. It's always beneficial to learn from the mistakes of other marketers so you don't have to learn the hard way and risk brand damage or reduced sales. 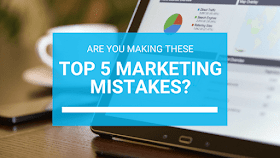 If you are making these top 5 marketing mistakes, it is time to pause those efforts and begin putting more focus and energy into marketing tactics that are targeted and effective. Most marketers and business owners know that they should be investing time and money into producing content. However, producing a ton of content that is of little value to your audience can actually hurt your business more than it will help it. As a marketer, you need to cater to the needs and interests of your audience to capture them, while still ensuring there is a tie-in to your service or products. Focus on content production goals that are realistic and will stress quality over quantity. Check your analytics platforms to see what types of content performs well and what types are ineffective. Producing content for the sake of content is not going to help you, but diving into what information is truly useful to your audience -- and delivering on that -- will absolutely put you on the right track. Any marketing individual or team needs to have a strategy in place before moving forward with action items on your marketing plan. The strategy should guide your overall marketing plan and always be referred to before making big decisions in a marketing campaign. With that said, it is easy to get carried away on strategizing awesome ideas for your marketing plan and then fail to follow through. Be mindful when creating a marketing strategy to ensure the strategy is realistic. Break the strategy down into a task list that can have each member of your marketing team responsible for a different item. This creates accountability to follow through on strategy, allowing your team to measure results and see what is effectively driving business and what other parts of your strategy are not working. As a marketer, high quality graphics are important for drawing in an audience when your headline is not enough to grab their initial attention. If your company is hesitant to invest in graphics or video content, you are most likely missing out on a huge audience. Video content drives a whopping 157% increase in organic traffic from SERPs. Adding an image, such as an infographic, to a Facebook post is another way to get more engagement and eyes on your content than a traditional text-based post. Note that this does not mean using stock photos or video, but instead keeping someone in-house to do graphic design for ads and marketing collateral, or outsourcing this work to a professional. You have an email newsletter going out and tweeted a little bit today… are you now wondering where the engagement and leads are? The truth is, hopes of big engagement for making small and non-focused efforts are far-fetched. If engagement is the result your business is looking for, there needs to be a consistently executed strategy behind every marketing initiative your team churns out. What are you doing or offering to pull the audience in? Why is what you are creating something that is worth them investing time (or money) into? These questions should be encompassed into your efforts in order to maximize engagement. Thinking of marketing and sales as the same thing is a quick way to being ineffective at both marketing and sales. Marketing is often a long game. Rather than using every piece of marketing collateral to go right in and make your ask, use your marketing strategy to build a relationship. Deliver content, offers, advice, etc. that are of value to your audience. If they aren’t ready to convert, your brand will still be in the back of their head when they are ready to move forward -- as long as your strategy is consistent. Consistently going after the sale or conversion within your marketing strategy can become a turnoff for consumers and could do more harm to your relationship with your audience. Build connections and encourage engagement to set your brand up for the sale when the timing is right. I hope you enjoyed this article about major marketing mistakes that you need to minimize or avoid to prevent doing damage to your business. Interested in more articles about business mistakes to avoid?